‘Kovair Visual Studio 2013 Adapter’ integrates Visual Studio 2013 with other ALM tools to provide an integrated view of the unified software development. It enables data from all the connected tools to be accumulated in a central repository. Various reports and actionable metrics that are derived from this central repository can be used to design interactive dashboards for different stakeholders. This presents a consolidated view of progress through the various phases of the project lifecycle. ‘Kovair Visual Studio 2013 Adapter‘ along with the ‘Kovair Visual Studio 2013 Plug-in’ benefits the development community in several ways. It helps in tracking all the artifacts from each of the phases of the development lifecycle. For instance, various models designed by the architects; code written by the developers; code reviews and static analysis done by the reviewers; unit testing done by the developers, can all be synchronized with other ALM tools that are connected to the Omnibus integration platform. Kovair Visual Studio 2013 Plug-in enhances the power of the Visual Studio IDE by enabling the developers to push relevant information from the IDE into respective artifacts. It allows the developers to track and relate code level information, modeling information, and testing information with simple mouse clicks. The simple and intuitive interface provided by Kovair Visual Studio plug-in ensures a minimal learning curve for developers who are more comfortable working from the IDE. Kovair Visual Studio 2013 plug-in enables developers to convert a code base into traceable items such as File, Class, and Method. These are later used by other developers to link to their Requirements or Defects for traceability purposes. This plug-in can also correlate the unit test case method and the file information that are generated using the Visual Studio Tester. It allows the Visual Studio users to directly submit Defects from the IDE that has occurred due to the failure of the test case execution. Kovair plug-in for Visual Studio 2013 allows artifacts from all the connected tools to be displayed from within the IDE. The developers can add/view/edit the Requirements at RequisitePro or Defects at JIRA from the IDE and can also view the Tasks being assigned to them. The developers can update the Task status as their work progresses and can also mark the Requirement status as Implemented. Such updates made from the IDE reflect on the relevant source tools. Kovair Omnibus Visual Studio plug-in allows Visual Studio users to access artifacts of other tools directly from within their Visual Studio environment. ALM tools, such as RequisitePro for Requirements Management, HP Quality Center for Test Management, Atlassian Jira for Defect Management or any in-house tools that are integrated through Kovair Omnibus Integration Platform, are all accessible for direct user operation from Visual Studio through this plug-in. 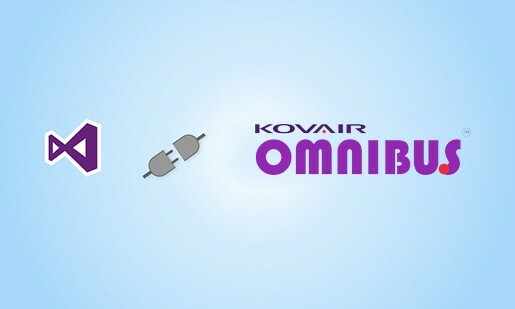 Kovair has built an Open Omnibus plug-in architecture that communicates with individual tools connected to Omnibus through adapters. 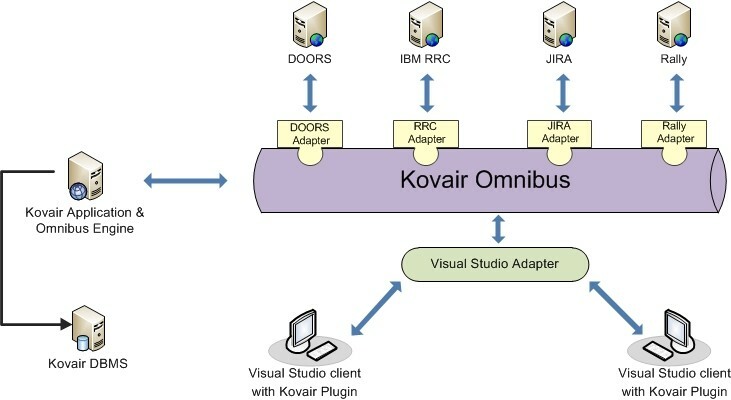 Kovair Omnibus Visual Studio plug-in is based on this architecture, and therefore can easily be used to add, view, edit and delete artifacts being managed in any of the best-of-breed tools that are connected to Omnibus. Kovair Omnibus Visual Studio Adapter works in conjunction with the plug-in and allows users to convert any Visual Studio artifacts such as Design Diagram, Design Element, File, Class, Method and Test Case into an artifact that can be traced with respect to other external tool artifacts in the integrated ALM scenario. Enables developers to view/edit their work items in their IDE that may include work items from other repositories such as TFS, Sharepoint, JIRA, and Bugzilla. Allows direct creation of Defects from the IDE for Static Coding analysis failures. Enables viewing of complete traceability information of all the ALM artifacts from the IDE. Rich plug-in explorer allows the user to navigate between various projects in the ecosystem. Shares Build information with other ALM tools though the integration bus. Support for tracking Visual Studio artifacts such as code methods, classes and files. Support for tracking Visual Studio Tester unit Test Cases. Add, View, Edit and Delete functionality for artifacts of different tools from within the IDE. Support for setting up traceability relationships between artifacts belonging to two different tools. Enterprise level security and vulnerability handling. Web based codeless mouse click configuration screens. Bidirectional synchronization of Visual Studio artifacts with other ALM.